File photo: A Licensing Officer speaks with drivers waiting on their inspection certificate stickers at the Licensing Office in Caroni. WHILE admitting there was a shortage of inspection books, Works and Transport Minister Rohan Sinanan declared there was no shortage of inspection stickers. 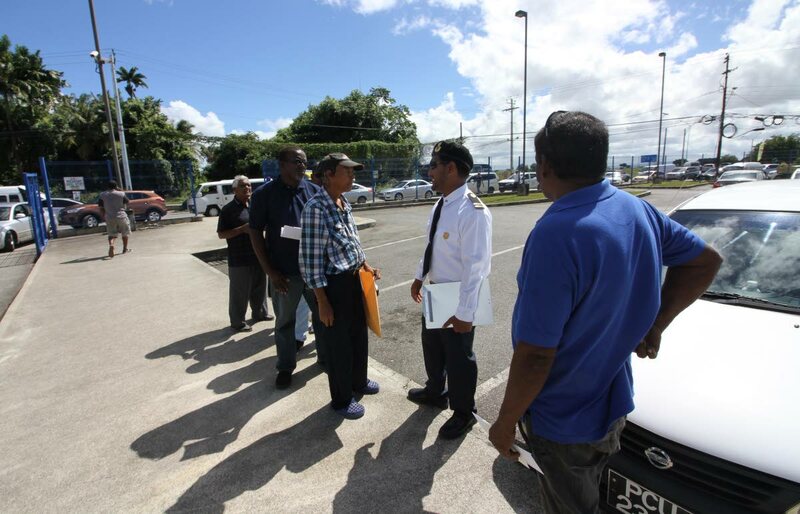 He said that was no reason for people failing to take advantage of the five-month moratorium implemented by Government for them to get their vehicles inspected. Sinanan made these statements yesterday in a signed letter in response to a Trinidad Express newspaper editorial. He said the ministry acknowledged that “the rush to have vehicles inspected did cause some depletion of the stock of inspection books” on Wednesday. But Sinanan added, “This was immediately addressed by the Government Printery whose staff worked overtime to ensure that the stocks are replenished and that citizens get their vehicles inspected.” Sinanan said the editorial “missed a golden opportunity for sober reflection” on what really contributed to crowds overwhelming the Licensing Offices and private inspection centres. He said an examination of the ministry’s social media platforms over the the last five months would show that citizens were “continuously reminded to make use of the moratorium and have their vehicles inspected.” Sinanan said he exercised his ministerial powers to amend regulations to allow goods vehicles up to a maximum weight of 3,200 kg to be inspected at private inspection centres. Previously, these goods vehicles had to be inspected by the Licensing Division. Sinanan said that singular act helped over 10,000 vehicle owners “granting them the added facility to inspect their vehicles at private centres around the country.” He said, notwithstanding that, “inspection centres and licensing offices remained virtually empty of persons requesting inspection services” until the last week in December 2018. Sinanan reiterated the current situation was not the ministry’s fault. He declared that as minister, “I am not the enforcer of the law. I am a policy maker and a legislator.” Sinanan said law enforcement resides solely with law enforcement officers. He appealed to citizens to comply with the law and avoid sanctions and said that could not be interpreted as a threat. Sinanan reminded citizens the law to ensure the road worthiness of motor vehicles had been existence in TT for 20 years. He added the law did not start last July with the moratorium. Reply to "Sinanan: Stickers not the problem"